Skin cancer is the growth of abnormal cells capable of invading and destroying other associated skin cells. 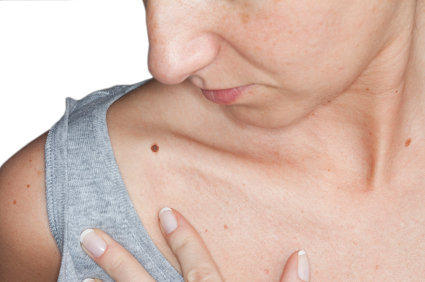 Skin cancer is often subdivided into either melanoma or non-melanoma. Melanoma is a dark-pigmented, usually malignant tumor arising from a skin cell capable of making the pigment melanin (a melanocyte). Non-melanoma skin cancer most often originates from the external skin surface as a squamous cell carcinoma or a basal cell carcinoma. In 2002, 50 percent– approximately 1.1 million cases–of all cancers in the United States were skin cancers, of which nearly 10,000 cases were fatal. It is understandable why many people have become fearful of the sun. For more research on the causes and thought provoking changes to our skin that occurred when we started eating grains, read this article from PaleoEdge. Keeping your diet clean and simple is your best bet in skin cancer prevention or recovery from skin cancer. Do not consume artificial sweeteners or MSG. Drastically reduce or eliminate alcohol, caffeine and refined sugar. Eat lots of organic fruits and vegetables, make sure your meat and dairy is pasture-raised (full of Omega 3s) and your fish wild-caught. Good fats include organic virgin coconut oil, virgin olive oil, avocados, and organic nuts. Over a decade ago, an Australian study showed a 40 percent reduction in melanoma for those who were eating fish–and this was without any attention to lowering omega-6 fats. Recently, the National Academy of Sciences published a comprehensive review showing that the omega 6:3 ratio was the key to preventing skin cancer development. According to Natasha Campbell-McBride, MD: “Skin cancer, blamed on sunshine, is not caused by the sun. It is caused by trans fats from vegetable oils and margarine and other toxins stored in the skin. In addition, some of the sunscreens that people use contain chemicals that have been proven to cause skin cancer.” Most chemical sunscreens contain from 2 to 5 percent of benzophenone or its derivatives (oxybenzone, benzophenone- 3) as their active ingredient. Benzophenone is a powerful free radical promoter, used in industrial processes to initiate chemical reactions and promote cross-linking. Benzophenone is activated by ultraviolet light to produce free radicals, known to cause cancer.5 The greatest rise in melanoma has been experienced in countries where chemical sunscreens are heavily promoted. As for the generally non-malignant type of skin lesions referred to as basal cell and squamus cell carcinomas, these we know are associated with exposure to sunlight, but there are other factors involved. These lesions occur when “DNA repair of ultraviolet light damage is compromised. Trans fats are a likely dietary factor that would impair DNA repair of ultraviolet light damage. Once trans fats are built into the cell membranes of the skin, many reactions cannot take place, including those involved in DNA repair. In most situations, normal exposure to the sun is beneficial, not harmful, especially if you take care to avoid polyunsaturated oils and trans fats. If you are fair-skinned and are going to be in the sun for a long period of time, be sure to cover your upper body with a shirt, wear a large-brimmed hat and use a safe sunscreen. If you are not able to consume enough fish, then fish oil is an excellent way to hit your omega-3 fatty acid targets. Wild salmon oil is rich in vitamin A and D to help protect from a UV-induced sunburn and cancerous changes in DNA. What makes it unique to any other fish oil is that it contains astaxanthin, which is a carotenoid that acts as a natural sunblock for marine plants. Research shows that astaxanthin prevents cancer initiation by protecting DNA from ultraviolet and oxidant damage, reduces liver fat and triglycerides, reduces the impact of glycation, and keeps skin young. These two wild salmon oil products are the best ones available. Cod liver oil is a superior source of vitamin A and D to protect the skin against aging and cancer, as well as anti-inflammatory omega-3 fatty acids that everyone needs to balance the omega-6 intake. There is a balance of making sure you are not getting too much sun, but also getting enough for vitamin D production. Cod liver oil provides a daily source of vitamin D through the seasons (especially in northern climates) without overexposure to sun damage. These two cod liver oil products are the most superior forms of cod liver oil, preserving the viking era methods. Vitamin C is a well known antioxidant capable of recycling vitamin E, both of which work together for the integrity of inside and outside every cell. A recent 2014 study found that vitamin C protected against UV irradiation-induced apoptosis by re-activating tumor suppression genes in skin cells. Higher doses of vitamin C is needed for most who do not have access to freshly picked vitamin C rich food. Many berries contain strong antioxidant qualities and the phytochemical ellagic acid – highest in wild berries, raspberries, strawberries and pomegranates – with several studies showing it can inhibit the growth of tumors of the skin, esophagus and lung. You can also use a cold processed raw blend of 8 wild berries from the Canadian mountains called Berrimax. I have found using this with the raw wild greens concentrate really makes your skin noticeably glow. This isn’t surprising if you have seen wild berries and greens in the wild, which seems to be impossibly bright and healthy. Given the price of berries for what seems like one serving, this gives you daily dose of all the amazing compounds. High in folate, lutein and zeaxanthin, leafy greens can help protect your cells from the damaging effects of free radicals, caused from sun-induced inflammation and extended sun exposure. An association of green leafy vegetables with decreased risk of skin cancer has also been reported, and a higher consumption of fruits and vegetables was related to decreased risk of SCC risk by 54%.The more sun exposure you have, the higher your folate requirements. These amounts may be even higher with certain gene variants in MTHFR. Eat with a fat source like avocado or olive oil for optimal absorption. Here is the wild geens blend called GreensFlush. I think both Berrimax and GreensFlush have gone under the radar. This one contains raw wild dandelion greens, burdock leaf and nettles, blended for detoxification, and therefore healthier skin. Dandelion greens alone are high in vitamin K, zeaxanthin, carotene, lutein, vitamin C, B6, riboflavin and many other trace minerals. Rich in lycopene, a bright red carotenoid that has been shown to protect our skin from harmful UV damage, watermelons and tomatoes can help reduce the risk for skin cancer. One study found that lycopene was photoprotective, and inhibit proliferation of several types of cancer cells. Watermelons have 40 percent more lycopene than tomatoes, and this water-rich fruit can help protect you from sunburns and sun damage. Isn’t it remarkable how nature provides these during the summer? Eat both with a fat source of optimal absorption. Feta goes well with sliced watermelon, and olive oil with tomatoes. Other small amounts are found in calendula, pink grapefruit, guava, papayas and apricots. 1. Skin Cancer, Thomas Cowan, M.D. Wise Traditions in Food, Farming and the Healing Arts, the quarterly magazine of the Weston A. Price Foundation, Winter 2005/Spring 2006.